Humans are social creatures that are drawn towards self-organization, establishing social norms and decreasing anarchy within the system. This idea is prevalent in our daily life, from the community level, to the larger-scale society and governmental institutions. Even since the beginning of human history, we have organized as hunter-gatherer communities. Soon after the discovery of agriculture, we form communities, develop religions, establish governance systems and social norms. Upon examining Britton Plaza, I have noticed many examples of this human nature. In the center of the image, we see a group of students standing and talking to each other – representing the idea of self-organization. Chairs and tables, as facilitators of conversations, where students hang out during the day, are arranged in an organized matter surrounding the plaza. Bike racks are set so that all bicycles coming into the HUB can be chained in a designated area that is not obtrusive. All the posts used previously for some event had been neatly put in one place, to be collected the next day. Near the HUB, we see trash cans placed so that students can dispose of their trash. 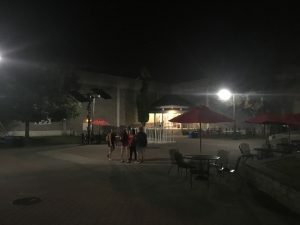 As we can see, Britton plaza is a small representation of social norms and rules of law established by an institution. The organization of the plaza could have been in complete anarchy. Students could have taken the chairs or moved them around as they will. They could have thrown trash anywhere they wished, or chain their bikes to any place that they wanted. Yet, they chose to follow the rules that had been previously set by the school. Perhaps they fear punishment and judgment from societal pressure, or because they understand that having objects set up a certain way increases the productivity and efficiency of the community. Nonetheless, there will always be those who defy social norms, those who don’t believe in the rules that are set. The seal on the plaza is the perfect embodiment of this. There is a general belief among students that stepping on the seal will make you not graduate on time. People avoid the area surrounding the seal, in the fear of stepping on it. However, there are those students who casually walk over the seal, completely undermining the belief system. I find it very interesting that through the application of a different perspective on viewing a landscape, I am able to draw these connections between the organization of the space on Britton Plaza to the ideas of human nature itself.